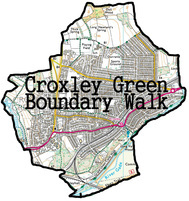 The Croxley Green Boundary Walk is signposted in a clockwise direction however; the walk can be completed in any direction. The walk follows the boundary of Croxley Green and some of the sights to see include; the Village Green, Dell Wood, the Grand Union Canal, Croxley Common Moor, Croxley Great Barn, Scotsbridge Mill and views of the Chess Valley. The walk should take 2.5 to 3 hours to complete. If you want to do it faster, sign up for the New Years Day "Boundary Walk Runaround"
For ease you can download either a one page or two page version of the map to take on the walk with you. You can also print out the picture above if required. For the techies out there you can download the files on the right to use with GPS enabled phones Sat Navs etc. Whislt completing the Croxley Green Boundary Walk, you will pass the Croxley Green Great Barn. When planning your walk (if on the last Saturday of the month) it would be a great time to visit the great barn and soak up a bit of the history of Croxley Green.